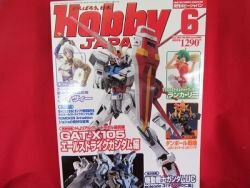 Title : Hobby Japan Magazine 06/2011 #504 Japanese Model kit & Figure Magazine Language : Japanese. This is an official book. Release Date : 06/2011 Number : 504 Total Pages : 350 pages Condition : USED. Very Good. No missing page. If you love Japanese Anime Model kit and Figure don't miss it!